Every year on the last Sunday of Advent, the Sunday before the Nativity, the lectionary presents us with a gospel concerning the Blessed Virgin Mary. It is the Church’s reminder that the time of our salvation is approaching. Through the lives of two pregnant women this text offers powerful imagery of our approaching salvation Elizabeth is old; too old to be pregnant. She should be barren but, by the grace of God, she is pregnant. Mary is young and a virgin; too young to be pregnant but, by the grace of God, she is. One is married the other unmarried. One’s child is the son of a man named Zechariah; the other’s child is the Son of God. One will give birth to the Voice who will cry out in the wilderness, “Prepare the way of the Lord.” The other will give birth to the Word made flesh. Yes, the time of our salvation is drawing near. 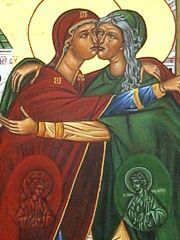 At the sound of Mary’s greeting Elizabeth is filled with the Holy Spirit. She recognizes and greets more than her younger cousin. She embraces the divinity carried inside Mary. She recognizes Mary as the Mother of her Lord. On this day Elizabeth greets salvation. At the sound of Mary’s greeting John, the forerunner, leaps for joy in Elizabeth’s womb – the unborn prophet greeting the unborn Messiah. Together Elizabeth and John, by their greeting, proclaim that the time of our salvation is approaching. In many ways our own lives are a series of greetings, one after another. Every day we greet one another – family, friends, colleagues, strangers, enemies, and those in need. Everyday we greet the circumstances of our lives – joys, sorrows, successes, disappointments, losses, struggles, the mundane and the exciting. Every one of those greetings is pregnant with new life and the possibilities for love, compassion, forgiveness, reconciliation, healing, joy, beauty, wholeness and holiness. In other words, the greetings of our lives are pregnant with salvation. So, I wonder, how will we greet the next person we see? How will we receive the most recent news and circumstances of our lives? Will we recognize, greet, and embrace our coming salvation? love this, mike. Sounds like you turned answered the question you asked.